I like how the novices are out in the street and not hidden somewhere. Ray: Novice monks spend a lot of time in the public eye, Larry...either walking with the senior monks as they collect their daily alms, or on edutainment excursions such as this one I captured. Jolie photo de ces enfants. Ray: Thank you, Peter...he caught my eye, too, and so found his way into the images. Oh, so many novice monks, there is no problem to find monks like in our western countries. 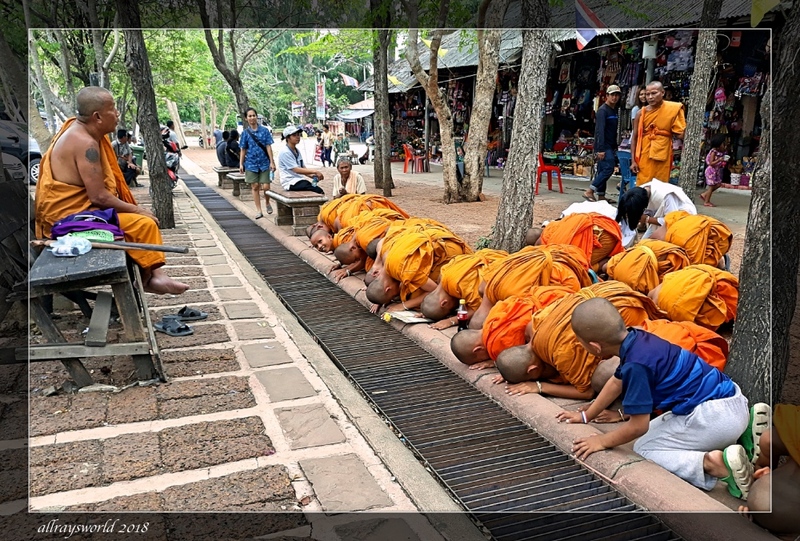 Ray: Nearly 100% of Thai youths spend so time as a novice monk, Philine...it is like part of their Coming Of Age rituals. Everybody knows the rules, they're brought up with it. Do you detect that being a novice monk sorts kids out for adolescence and adulthood? Ray: I see little evidence that spending time as a noovise monk has a lasting effect, Chris. Ray: All good fun, Bill. Ray: Presque tous les garçons thaïlandais passent du temps en tant que moine novice, Claudine ... la plupart ne continueront pas comme moines. Ray: In a group like this there are always a couple of non-conformists, Martin...a healthy thing in my opinion. Quite an experience for them. Ray: For some it will be their first experience of living away from home. Ray: It is the long school holiday, Mary, and these youngsters will probably be novice monks living at the temple for about three weeks before going back to school. I see a junior novice monk starting get involved. he obviously knows that the life of a monk is one big party. Ray: Their big challenge is likely to be getting up at 0330 each morning to chant. Ray: Thank you, Frank. I was sitting quite near the senior monk, slurping an iced coffee in the shade, so had a good vantage point when the little monks waddled along. I love the little "pre monk"
Ray: He sees to have been through the shaving ritual, so I am not clear of why he is not wearing robes, Elizabeth.